Every once in a while, radio stations in some of Texas’s minor-league cities have me on to discuss the local prospects and the Rangers. In one early April interview*, I surprised a host (and myself, really) with my optimism at Texas’s chances to win the division. Not that I believed Texas would wins 95 games, or even 90, but I felt the lack of a single good or bad team in the West left the door open for everyone. Thus, the AL West club that combined a hot streak with a key in-season acquisition would win the division with perhaps as few as 84 games. 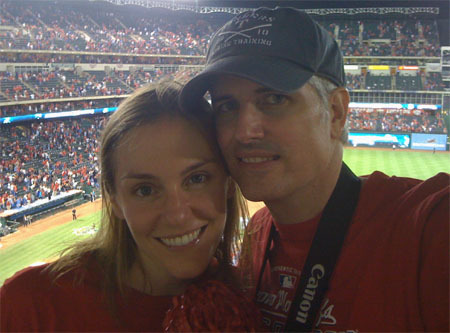 Forced to choose, I selected the Angels, who always seemed to outperform expectations, but I insisted that Texas had a very good chance to play in October for the first time in eleven years. 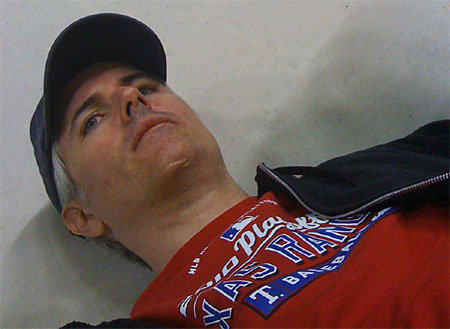 Author reaction to ALCS Game 1 8th inning. The Rangers, in fact, rode a hot streak (20-5 through most of June, after which they were only 44-43) and made the essential acquisition of Cliff Lee. That trade effected a paradigm change for discerning fans. 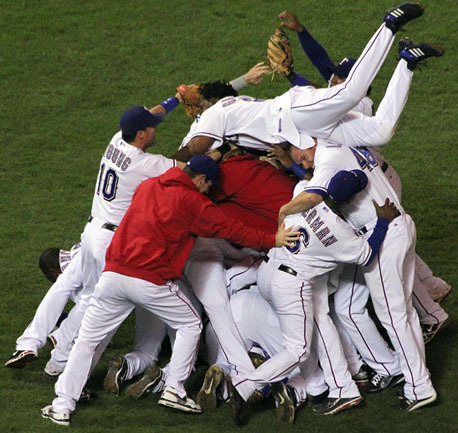 Much of the national media (and many locals) would continue to describe the Rangers as underdogs and upstarts because of their decades-long inefficacy. More careful observation revealed an organization focusing on a lengthy October run. 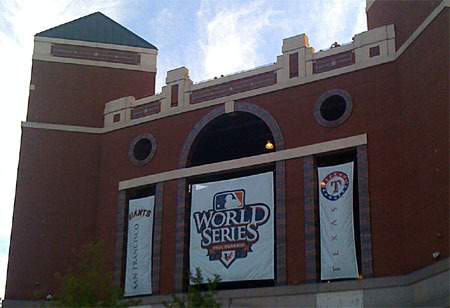 Amazingly, in early July, the hapless Rangers were constructing a World Series contender. Notwithstanding some tactical miscues, Ron Washington excelled at keeping the players upbeat and relaxed (which, coincidentally, made the team very easy to root for and fun to watch). The late-90s Rangers were notoriously uptight in the postseason, with them and their fans seemingly in thrall to the Yankee Mystique. In contrast, at no point during the last month – not after losing twice at home to the Rays, not after the ALCS Game 1 debacle, and not down 3-1 to the Giants – did I feel the sense of doom that pervaded the 90s. As soon as Texas won that first game in St. Petersburg, the past disappeared. 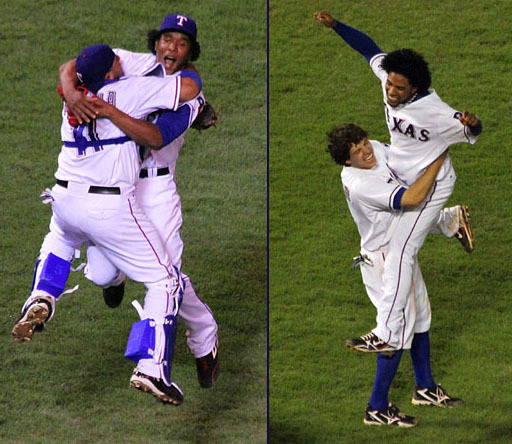 Win or lose, the 2010 Rangers would stand apart. This banner was not photoshopped. I’ve got mixed feelings about the Series. Despite all Texas achieved, there’s an opportunity lost. In postseason baseball, the “better” team loses a substantial portion of the time. Though I never felt they were more than very slight underdogs in any series, the Rangers did advance to the World Series with the worst record among AL competitors. Next year, the Rangers could be significantly better during the regular season but lose in the divisional round to an inferior team. They could miss the playoffs altogether. Nothing is guaranteed. 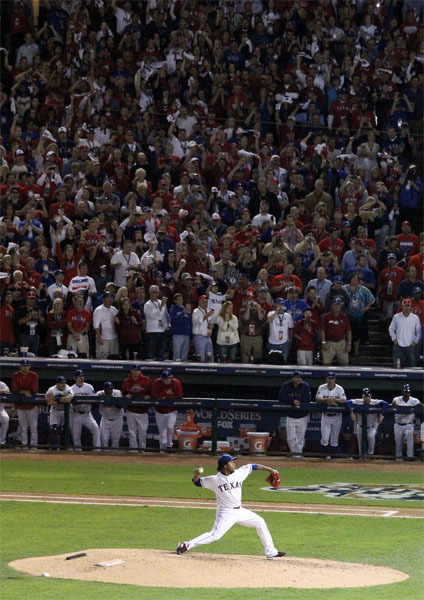 The last pitch of Texas’s one World Series victory. That said, this was a special year. I’ve been following this team since moved to Arlington in 1972. Though I’m too young to remember, my father says he took me to see the Dallas-Fort Worth Spurs in what was then known as Turnpike Stadium. 2010 was the belated payoff for me and all the fans who’ve been there since the beginning (though just about any fan of more than a few years has undergone his or her fair share of suffering). Texas will never again win a postseason series for the first time, never vanquish the Yankees for the first time, and never win a World Series game for the first time. I was able to watch it all, often in person, always with my wonderful wife, and for that I am very grateful.